Bambi. I usually can't see a deer without thinking of the Disney movie. There are tons of deer here. I see them multiple times each day. I've seen so many this last week that I don't think of Bambi anymore. I almost think it's normal to see a deer dart in front of you while driving, running or mowing the lawn. Lately my mind has started going other places deer. A couple of days ago when I was running, I saw a deer drinking from the drainage ditch next to the main road of our subdivision. There were two ducks floating beside it in the puddle. This picture so accurately describes where I live. I looked at the deer. I was able to get really close to the deer because she was so thirsty, the things that usually scare her didn’t drive her away from the water. I told God I want to be like that deer. I want to want Him so badly that the things that usually scare me won’t drive me away from the Water. Then, last night as I was leaving Bible study, we saw three bucks, hugs bucks, darting through the parking lot. These guys were so fast, they looked like black streaks in the dusk air. The children and I just sat and watched them for a couple of minutes and then when they started really galloping and leaping quick, we chased after them in our car. They just kept on running, never looking back. They didn’t look scared. No deer in the headlights looks came from these three! They just kept going until they got to the edge of the woods and disappeared. The Message uses the word “surefooted” to describe this deer. I told the Lord I want to be like those deer. I want to be surefooted. I want to climb to the heights and stand there. If I know where I are going, I won’t look back with those deer in the headlight eyes of fear and indecision. I will run with sure feet, eyes on the prize, able to ignore the things that used to distract me with fear. I will run forward ready to drink deeply from the Water on my path. Where are you headed today? Can you run ahead confidently? Will you take time to stop and drink deeply next to the ducks? Doesn’t it feel good to cross something off your to-do list? Doesn’t it feel great to cross somethings off your to-do list? I’ve crossed off my list today. I started running again this weekend. This morning I started running before 7 AM. Check. I ran about four miles. Check. I sensed myself mentally checking off my list before my feet had reached the end of the street. I mentally ran down my very.very long list. I mentally felt the oh so wonderful sense of relief as I checked each,and.every.little.thing off. Ahhhhh. Freedom. My thoughts halted. Freedom? From a list? That is so not the truth my heart rests in. Freedom is found in Jesus and doing the things He has laid out for my day. Realistically I won’t get all the things done on my list. I have four children. They slow down list completions. They interrupt list checking. They have lists of their own. I prayed asking God to give me the freedom to use my list to help guide my time but to rely on His Spirit to guide my hands, my feet, my heart. I want the freedom He offers not a vague illusion offered by completing a list that will need redoing tomorrow or next week because groceries get eaten, bathrooms get used and exercise is only good for one day’s checkmark. The tasks Jesus has for me such as investing time with a child explaining baptism, serving my family with a humble heart and seeking the heart of a God who can truly set me free, won’t yield an empty return. Lord, set my heart about what matters most today. Keep me from focusing on the unplanned. Keep me focused on Your plan. May I see Your hand and feel Your heart today. Amen. Very few have ever claimed to hear God’s audible voice but many, me included, claim to know God’s voice. How do you recognize God’s voice? I was reading in John 9 this morning. I’ve been pondering the story of this blind man. I’ve been thinking about his healing for quite some time and maybe I’ll share with you my thoughts later but today I hovered over the last few verses where the man recognizes who Jesus is. He hears His voice and immediately believes then worships Jesus. I love how when Mary goes to the tomb to find Jesus’ body, she finds a “gardener.” She does not recognize Jesus until He speaks her name. At the sound of His voice, she instantly recognizes Him. I’m thinking how similar this is in my life. I’m simply going about my day when something interrupts me and suddenly I recognize Jesus’ voice. Now, I don’t hear an audible voice but I do feel a catch in my heart. Sometimes it’s a thought that is much too complex or beautifully put together to be from my mind. Sometimes it contains wisdom connected to God’s Word that I’ve never seen before that instant. Sometimes it’s just a revelation where I suddenly know the answer to something I’ve been praying about for awhile. Whatever the case, however you want to explain it, I know it is God speaking to my heart. It still takes my breath away every time it happens and I still wrestle with questions and emotions when I want to hear Him clearly and I can’t. Last night I took some time to sit with God and just ask Him how to get from point A to point B in my life right now. I have a few questions. After a bit I just felt like He was nudging me to some action in my life. For me the action was as simple as a couple of emails, research on the internet to pray about some other decisions and setting a couple of goals for myself. If you’re feeling unrest, questioning or dissatisfaction in any area of your life, try sitting down with Jesus today and just simply asking Him where to go from here. If you don’t get an answer, try sitting again tomorrow and the day after that. By being silent in His presence, you create and cultivate an atmosphere in your heart where His voice can resonate and eventually, you will recognize it. I think about Samuel in the temple sleeping. He hears God’s voice but doesn’t recognize it. Eli tells him how to respond to God by saying, “Speak, Lord, your servant is listening.” Samuel responds to God and God speaks to him. Today I’m going to listen for God’s voice Samuel-style. I’m going to respond like the blind man and seek Mary’s intimacy with Jesus. Will you join me? Sometimes a little bit can make a tiny difference. And sometimes a little bit can make a huge difference. A little bit. Five barley loaves and two fish. That's all there was. A little boy's lunch. Now, Jesus knew what he was going to do with that lunch. The Message says he questioned Philip to "stretch his faith." My mind couldn’t let go of this thought from yesterday’s post. Jesus already knew what He planned to do. He just wanted the disciples to come be a part of it. I’m realizing all day long, I get invited to be a part of what Jesus is doing in my home and in my heart. A little bit a time. A peanut butter and jelly sandwich with the crusts cut off. Sometimes a little bit is all I have to offer. These days are long for me. Actually, yesterday was the longest day of the year, literally. But, beyond that, I’m more tired than usual. The sun is hot and the air is thick. Just stepping outside would drain anyone. I’m frustrated that this fatigue is hanging on and just plain tired of being tired. But, a little bit encourages me. Although my children are a little more self-sufficient than other summers, they need me in different ways than they used to. They no longer need me to follow them around the house picking up potential hazards in their paths. They no longer need me to sit and sing countless Barney and Yo Gabba Gabba songs with them. They no longer need me to teach them how to hold their pencils and recognize the letters in their names. They can even spend a great part of each day occupying themselves by reading, creating or imagining largely unsupervised. They need me to listen. Constantly. They need me to teach them how to make macaroni and cheese, how to start the dishwasher and how to put their covers neatly on their beds. They need me to remind them which one is their underwear drawer and that it’s not under their bed. They need me to cherish the masterpieces they create with markers and show them what letters look like in cursive. Except for the four-year-old. He needs the first list. They need the latter list. That’s a long list of little bits. But, today I’m encouraged because I may not have much, but I do have a little bit. And, I keep thinking. If I practice giving my little bits to them, just maybe I’ll master giving my little bits to Him. And then maybe just maybe, piece by little piece, I’ll eventually give my whole self. Because sometimes all we have to give is a little bit. And a little bit can make a difference. I can certainly sympathize with the disciples' predicament of having to feed five thousand people. Six sometimes feels like five thousand. Know what I mean? I often come to the place the disciples were in, it's dinner time and I haven't got a clue. Now, I know all you meal/menu planners who make one trip the grocery store each week and use your leftovers to whip up tomorrow's dish just cringed. It takes a monumental effort for me to function like that and all my monumental efforts this year have gone to causes other than meal time. Takeout, peanut butter and jelly, hamburgers and grilled chicken have dominated my imaginary menu these last few months. And, let's face it, with a family of six there just aren't that many appetizing leftovers. In my defense, we did take a massive shopping excursion yesterday. We have some great meals planned for this week and I'm actually excited about the chopping, planning and preparing that goes into a healthy, home cooked meal. When I became a mother, this story ministered to me greatly. I daily, hourly, minutely felt overwhelmed at the number of needs due to the sheer volume of people depending on me. It was so overwhelming to me in fact, that some days I just wanted to sit down and not get get back up. I have a tendency to do nothing if I don't think what I'm doing will make a difference. Today, I think I'm mature enough to realize sometimes a little bit can make a tiny difference. And sometimes a little bit can make a huge difference! A little bit. Five barley loaves and two fish. That's all there was. A little boy's lunch. Now, Jesus knew what he was going to do with that lunch. The Message says he questioned Philip to "stretch his faith." Are you familiar with God's little questions? I am. I can feel a question forming in my gut and I know to pay attention to the answer. As I read this passage again this morning, I felt a nudge to pay attention to the leftovers. Jesus fed five thousand people with a small boy's lunch. He fed them until they were satisfied and there were still twelve baskets left over. Twelve baskets. That's more than he started with! Twelve baskets. That's enough to feed a small crowd. Twelve baskets. Jesus says for those who believe in Him, "rivers of living water will flow from his heart." Now, I don't know about you, but I know if rivers of living water are flowing from my heart, I'm certainly not dry by dinner time. I would certainly have energy to cook a healthy dinner, supervise bath time and patiently linger while tucking each child in bed. I would most certainly be able to clean the kitchen and cuddle with my husband on the couch even with radiation fatigue and jagged, incomplete thoughts swirling in my head. Those are leftovers even I would gladly serve! PS You can join the John study here. When I woke up Wednesday, I had a terrible migraine. Maybe it was the new mix of pain meds or maybe it was the days and days without sleep or maybe it was a good old-fashioned virus but either way, I was sick. I got dressed and headed to Houston. We weren’t too far down the road when I asked Andrew to please pull over. It’s been years since he heard those words and as I leaned out of the car on the shoulder of the highway, all he could say was, “Are you sure you’re not pregnant?” Anyone with four children who suffered nine months of unrelenting morning sickness each time can relate to that question. While laughing! After several pull-overs, we made it to the medical center. I hugged Eyob, our favorite Ethiopian parking attendant and he sent special hugs for Palmer. The doc said my skin looked good and he was thrilled with its appearance. He kindly acknowledged that I, however, may not be so thrilled. Yeah, I said, “Ouch!” I shook the doc's hand, hugged nurse Mitzi and the doc said he hoped he never had to see me again. That was funny. Andrew and I headed downstairs for the final treatment holding hands. It felt surreal. But then again, the last six months of my life have felt surreal and I’m not quite sure what I’ll feel like when I really wake up. We waited a bit then Bette and Leslie, part of my rad movie star team, called me back. Andrew checked out the radiation room and watched me get set up for treatment. Then I had my final treatment. They beamed me up for a few seconds and then we were done. I got dressed and headed for the famous bell. Now, nausea and I don’t go very well together so I didn’t really think that ringing the bell would make me feel better. I honestly just wanted to go home and crawl in bed and think about the whole I’m done with radiation treatment and I rang the bell thing later. That’s what throw-up does to me. It makes me become uncaring and indifferent to life’s biggies. But, when I started ringing that bell something happened. I felt renewed. I felt excited. I felt encouraged. I felt accomplished. It brought back memories of the last time I heard the tinkling of bells. It was almost fourteen years ago. Andrew and I had just gotten married. We left our reception to the ringing of bells. The country club didn’t allow birdseed or rice and we would be responsible for cleaning the tiles if we chose to use bubbles. We settled on bells. Bells are special to me because my grandmother had quite an extensive bell collection. She collected bells from all over the world. She recently downsized and kept only the most special bells. Each time my children visit, she gives them each one of her special bells. They love these little bells and I hear them quite often ringing around my house. When we got married, I loved hearing the bells ring because their sound reminded me of the rich heritage of marriage my grandparents passed on to me. Both sets of my grandparents’ marriages have been filled with many years of deep, sacrificial love. Bell-ringing to signify the end of cancer treatment is significant to me because my bell-collecting grandmother is also a cancer survivor. She has not only given me a great legacy of marriage but one of surviving as well. I can’t begin to thank you all enough. I have read, reread and marveled over all your comments, emails and facebook messages. I know I will discover more comments from you as I click around on my computer. Let me tell you, an ordinary girl like me has never felt so special, so cherished, so loved. When I rang that bell yesterday, I not only rang it for me but I rang it for you as well. I will post the thoughts that clanged around in my head as the bell tolled later but for tonight, know that just as I’m embarking on a new beginning, starting a new phase of life, God has something new for each of you too. As I pulled the rope that rang the bell I prayed that God would give you courage to ring your own bell, to say yes to His open invitation and to just go and be the blessing you have all been to me. Let’s all find a way to pay this forward. Again, I am simply overwhelmed at your kindnesses. 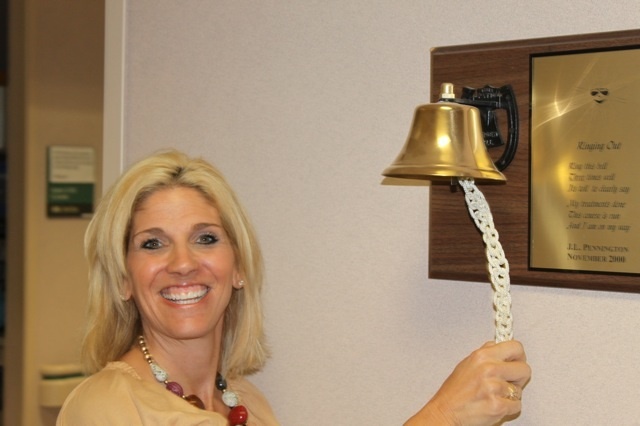 I cannot believe how many of you would remember that I was ringing the bell yesterday. I was moved to tears by how many of you rang your own bells, logged onto my blog and facebook repeatedly to check on me and text me to tell me you were cheering for me. For those of you who God used cancer to bring into my life, you are one of the things I can thank God for in the midst of the road called cancer. For those of you who were stuck in my life anyway, I love you for sticking with me through thick and thin. And it’s been a lot of both lately, huh? This is just a letter filled with love and gratitude from one cancer survivor to the world’s best support system. If you have been a part of praying for me, please keep lifting me up regularly. Pray for me because I do have a question for God. What now? I went to high school with a girl named Ashley. We didn’t know each other then. When I got a cancer diagnosis and “everyone” started joining my prayer page, Ashley did too. She felt a kinship with my story through my words. She got brave and emailed me. She has become a cherished friend. I will be forever grateful for her courage to step out of her box and reach out to a stranger… and one from the dreaded high school years at that! She is very talented. She makes jewelry. This is her site. She has made a survivor necklace in my honor. Check it out. This is really a post about Ashley. Not me. Today, my last day of treatment, Ashley is facing her own medical junk (for lack of a better word). I’m just asking all ya’ll to pray for her today. Just like you’ve prayed for me. She needs her own miracle. I want her to know God hasn’t forgotten her. I want her to experience the amazing ways God works when His people pray. So, bloggy friends, do your thang. If you’d like to leave a word of encouragement for her, you can do it here. I’ll make sure she gets it. This morning on my drive, I’ll be lifting my sister, sharing the Love. An exciting day over here. Listen because at 10:45 I'll be ringing the bell to signal my treatment's a finished. It'll be LOUD! A great day for God to show up and show off. Big! Tonight, the eve of my last radiation treatment, my thoughts are all over the place. My team asked this morning and my husband asked this evening. Am I excited? Yeah. I am. I’m not all jumpy and spastic and stuff because I’m, well, tired, sore and a little melancholy too. Pain just throws me for a loop. I don’t know how to celebrate this so I’m taking some time to process it tonight. I definitely felt like today was worth celebrating. I was tired. The drive was tough. The kids were exceptionally well behaved. It’s like they knew. Mom’s had her limit. Be kind. Be helpful. They did. They were. This afternoon we explored the joys of redbox. We rented three movies. We sat in a pile on the couch in the dark and watched. Thanks to the good doc and cute nurse Mitzi, I was able to reach a combo of pain meds and bandages that worked and I dozed a bit. A good sleep always seems to help my perspective. And my energy level. If I get this right tonight and I’m able to sleep all night I might just be perky, jumpy and a little spastic in the morning. I haven’t slept in quite a few days due to pain. When I can get my pain under control the itching is completely insane. When I can get the pain meds to make a feel slightly woozy, I can’t get comfortable enough to sleep more than fifteen or twenty minutes. And so it’s been for the last several nights. Cat naps. I don’t like cats. On a side note, thank you all for all your suggestions on how to treat radiation dermatitis. I am always open to what worked for you. I will try anything. And this afternoon I actually feel better than I did yesterday. That’s a praise. Thank you, Lord! Maybe the normal thing to do the eve before you finish treatment is just what I’ve been doing. Sit in a pile on the couch with those you love most and just rest in their love and be thankful that treatment is almost done and there are more days to enjoy one another. I found myself here today. In Psalm 143. Today is Monday. The first day of the last week of my radiations!! That is so exciting. I am so glad that I have just two more days. These last couple of weeks have been hard. Four children, a loaded Suburban and a road trip every.single.day with a side effect of fatigue makes one t.i.r.e.d mama! My skin has started breaking down and it's also ready for this thing to be done. Well done. (pun intended) The good news is that we are surviving. We made our Monday trip and are resting now. Blessed rest! I'm pretty tired so today I'm just making an announcement. My friend Lysa is launching her new site today. She's doing some amazing giveaways this week. So hop over and join the fun. You'll be so excited if it's your first time to visit... you can leave me a comment thanking me (wink, wink). Enjoy your day. Happy Monday! Team Endure raises sarcoma awareness and runs in honor of me! This is the team that will come run my marathon with me when I'm well. I'm thinking I can do San Antonio marathon in November and Mo's thinking she can do the half with me. Wouldn't that be awesome? It's four days before my fortieth birthday! Today we needed a do-over. Yesterday we went to the hospital for my radiation treatment. All of us. The four children, a friend and me. We were going to reward ourselves by going to the movies afterwards. We didn’t reach our reward. Bickering, sassy-talk and complaining filled the car. I headed straight home. We all took a nice long nap. All of us. We woke up with better attitudes. We woke up re-focused. We woke up rested. Today was a do-over. We shopped for shoes. Four children all got new shoes. The reason this deserves accolades is because the first two stores we visited were sold out of our sizes. Four stores. Four pairs of shoes. Four happy children. Four ice cream cones. That makes a successful summer day. And an awesome do-over. While I was traveling last week, I had lots of time to think. Extended times of quiet allow me to indulge in some serious reflection. As I sat on the plane, I came to one conclusion. I am way too much like Moses. When God asks me to do something, I am full of hesitation. I offer many colorful excuses. I can’t believe God would really choose to use me. I don’t see how I could be useful for His kingdom. And I certainly proceed to tell Him all about it. On the ride to Orange County, I just got to the hesitation part. When God speaks, I hesitate. I hate it when my children make me repeat myself. I realized they are just like me. Ouch! I have determined to do something about this. The reason is twofold. I don’t want to hesitate with the Lord. When He calls my name, I want to scream yes at the top of my lungs, jump to my feet and run to His arms. I want to kiss the timid girl that whispers goodbye and embrace the me that lives large, sings loud and dances big. I also want my children to see what God can do with a life that lives in the yes. Because I know if you see a life lived in this way, you can’t help but want it. Maybe I was filled with hesitation and insecurity this past week because I went to visit Mo. The last time I spent any amount of time in person with Mo, I was twelve. Or maybe fifteen, that’s the year I moved. The last time I spent a weekend with Mo, I was filled with teenagerish and awkward emotions, doubts, insecurities and questions. I revisited those this weekend. Not in a bad way. The weekend was far from discouraging. It was one of the most encouraging weekends of my entire life. Since I got back, I’ve been having this dream over and over again. It’s of my dad tucking me in bed when I was little. He used to tuck me in real tight with all the covers wrapped snug around my body. I called it a cocoon. I loved how safe I felt in those minutes. How warm I felt. I loved how my daddy took the time to hold me close and reassure me of his love for me. Every night I spent at his house he would do this even into my teens. I treasured those moments that I felt safe in this world. I felt loved, protected and cared for in those precious few minutes. I realized this week that I’m still that same girl searching for some significance and reassurance from my Father. As I read the story of Moses last night, I realized Moses needed God’s reassurance. Six times in Exodus 4 alone, Moses questions God before he finally just goes to free God’s people. His job wasn’t easy. He tried again and again. And when the Israelites were finally free, Moses’ job only got more difficult! But God was patient with him. God let him know again and again that he was not alone. God filled in his gaps. God provided all he needed. I am reminded that even in my hesitation, even in my questioning, even in my insecurities, God has called me and His word is clear. He will do what He has said He will do. I was reading Psalm 73 today. I learned the words to it in a song many years ago. I just kept singing them all day long. I keep singing them because I want them to be the truth that I sink my feet into when I step out of bed each morning. I think this past week my body has failed. I’m tired. I can’t seem to get my house picked up, my laundry put away or errands run. My physical strength is depleted and I’ve run out of time. My mind has failed. It’s full of silly girl fluctuating emotions. I’ve bombed when God has asked me to do things. I’ve dropped the ball on several opportunities. I’ve said the wrong things and placed way too much significance on the temporary. I’ve failed to see what’s really important. I really hate that. Did you know one way Webster’s defines portion is this? A share received by gift or inheritance. Isn’t that so neat? God’s strength takes over where ours stops if we just receive it. God’s truth takes over where our emotions fall flat if we just accept it. God’s grace seeps all over the places I get heartbroken. God’s perspective helps me to see clearly when I find myself wandering in the dark. I love how the CEV says that God is my strength and my choice forever. Today I just kept thinking all day long how no matter how tired I got or how crazy I felt I was choosing God all day long. Let me be clear, I didn’t have a perfect day but I think it’s a start. I spent my weekend with girlfriends. Lots of girlfriends. My friend, Moshelle, lives in southern California. The weather is perfect there. I flew into Orange County (without any major mishaps, I should add). I had lunch on the beach with Amber and Brandy. I got sad that I missed Andrea and Kim (Who knew I had so many southern Cal friends?). I didn't get a picture of Amber but I got pictures of our amazing food... hmmmm... what does this say about our priorities? Then Mo and I drove to the desert. Murietta. There were hot springs there. I soaked my body in them craving all their medicinal qualities. Her church was having a ladies’ retreat. Lysa and Holly were there. Crossline Church has one amazing group of ladies. I loved everyone I met! I can’t wait to tell you all about it. You should check out Lysa's blog to see why this is tops on my list (The not-yelling voice, not the naps). We spent Sunday at the retreat talking about coming home and I wanted my homecoming to be successful. It’s good to be home and it’s good to know that I only have six more treatments left! The specific prayer request is that these next six will go well as tomorrow will mark the day that my treatment changes a bit. Starting tomorrow I will see the doctor and then begin getting a “boost” which is an extremely high dose of radiation (electron beam therapy) that goes straight to the tumor bed to make the tumor bed a place where a tumor would never want to live again. My skin is already raw and blistered in this area. The entire radiated area has a red, itchy rash but the area around my surgical incision is really tender and I’m not looking forward to the next week. But then again, I am looking forward to the next week because the next week, no matter how painful it gets, means the finish line. I like finish lines. And even though my pictures won't upload, thanks to Jesus in me (and to that nap I took), I won't lose my cool. Because God's girls were meant to keep their cool. Even in mini crisis like un-working zip cords. Speaking of finish lines, please keep Cathy’s family and loved ones in your prayers as Cathy bravely finished her battle with cancer yesterday. Cancer took her body but it can never take her Life. She has entered into a Life we don’t yet know. Please remember especially her husband, two young children, parents and sister. Today on the seventh floor, I got hugs and advice and really just the blessing of a shared experience. I didn’t get to see both my “friends” but I got to see lots of people and I did get to see some of my friends so it all worked out real well. Tonight I’m asking you to pray for Cathy and her family. Cathy is fighting advanced lung cancer. She is making the move to palliative care once they can get her pain managed a little better. She has two young children and a whole host of friends and family who love her very much. She has a huge faith in God and a mighty big battle to fight. 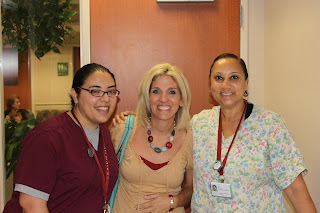 As I was leaving the waiting room, one of Cathy’s friends whispered to me. She told me to, “Breathe in faith and breathe out fear.” Aren’t those wise words? They hit home with me today. I feel like the fear part of cancer can kind of sneak up on me. It can envelope me when I least expect it. That’s stinky. Today the fear that is threatening me is a silly little girl fear. You see, back in April my husband and I decided that the only way to make it through the everyday monotony and emotional drain of radiation would be to have some breaks in my schedule. By breaks I mean to indulge in some fun stuff that I normally don’t get to do but that I would look forward to each week. I went to see Jimmy Buffett. I spent a day with my bff Ashley. I went to the beach with my family. And this weekend I’m flying to see a friend I grew up with. Our friendship was built on faith as we shared church and summer camp and Bible memory together as children. We lost touch when I moved in tenth grade until I attended her wedding. Then we lost touch until face book reunited us last year. It’s amazing to see how a friendship built on faith, even childlike faith, can last through the years. I can’t wait to spend time with her, hours on end just talking. I know we can go deep because even though the details of her life are vague to me, I know her heart. I share it. We both love Jesus like nothing else. We are attending a retreat with the ladies of her church. It’s almost like going to camp together all over again. We went to summer camp together for nine summers! And you wouldn’t even believe how excited I am about this weekend. I can’t wait to tell you all about it! But in order to experience it, I have to leave way early in the morning, go to treatment and then get myself to the airport, parked, taxied and boarded. Alone. This makes me feel twelve. When I decided 2010 would be my year of no fear, I wanted traveling alone to be one of the things that quit bringing me fear. I want the excitement to eclipse the fear. I hope that happens tomorrow. Because in July I have to do it again for She Speaks. Seriously, these things would have prevented me from going in the past. Like I said, I feel twelve. 2 a : to keep elevated b : to lift up. God won’t just not leave me alone, He’ll give me support even against an opponent, like fear, and He will even lift me up and carry me. I can’t wait to tell you the adventures of getting myself to the airport, parked, taxied, checked in and boarded. They are sure to be fun but not as fun as the adventures I will be sure to have with my girlfriends and God this weekend! I heard the bell ring for Longeno, Donna and Pat. I prayed with each note that their scans would come back clean next month. I prayed with each chime that their treatments worked and they would find freedom from cancer’s tentacles. I prayed that their lives would be lived out long and loud like the bell ringing that can be heard throughout the clinic. And when each of them walked through the exit door, I became “the veteran.” Now when the newbies sit down with their shiny folders and nervous grins, I get to look them in they eyes and greet them introducing myself. I get to be the one nominated to ask each “what they are in for” and “how many sessions they have.” I’m the one they ask where the bathroom is, if the wait is usually long and where the good coffee is waiting. Tomorrow I’m visiting patients that are currently in the hospital at MD Anderson. I’ve never been to the seventh floor and I’m somewhat nervous. I’m not sure what my emotions will do when I step foot into the waiting room or greet for the first time people I’ve only corresponded with via email but have my same diagnosis. It’s exciting and a little strange all at the same time. Like I said earlier this week, I think I’m finally accepting this cancer thing and what it means for my life. My bout with the beast may be short but it’s impact on my life will last forever. When I prayed, “Lord, don’t let me waste this,” I meant all of it. The good and the bad and I know that means sharing my experience and my God with those who are currently fighting for their lives. Guest Post from my Daughter!! One day I’ll never forget is May 1, 2010. That’s the day I moved. That morning I was given permission to bring doughnuts to school, so I could share them with my class. Everyone loved them! Towards the end of my day, two of my close friends gave me awesome gifts! Ingrid gave me a cute stuffed animal puppy with a sweet card. Lilly gave me a beautiful necklace. It is silver and very cute! After that I took pictures with my class and teachers, which tuned out totally fun! Then my mom picked me up early and after all the girls hugged me goodbye, I had to leave. It was so sad I could hardly move my feet to walk to the door. When we left, my mom took me to our old house and it was almost empty. The movers were just finishing. It was really weird and awkward to see the only house I had ever lived in empty.